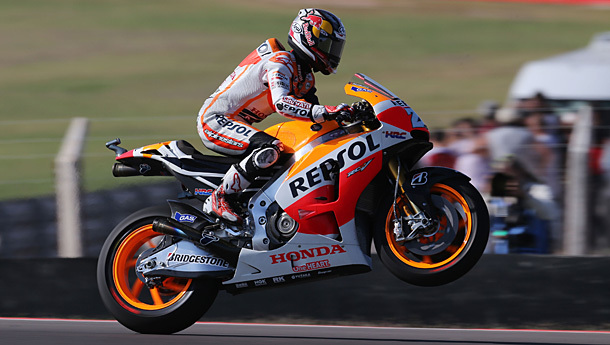 Repsol Honda’s Marc Marquez has claimed his third successive pole, continuing his perfect start to the 2014 for tomorrow’s 25 lap race at the Termas de Rio Hondo circuit in Argentina. Jorge Lorenzo returns to the front row to start from second position with Dani Pedrosa starting third on the grid. Marquez set a superb 1’37.683s late in the 15 minute showdown to maintain his 100% 2014 pole record while Movistar Yamaha MotoGP’s 2010 and 2012 MotoGP title winner Lorenzo improved his best time significantly in the final stages to qualify second, a 0.742s margin from pole. Pedrosa, meanwhile, was not far behind Lorenzo in third, his best time of 1’38.651s leaving him a second off the pole pace. 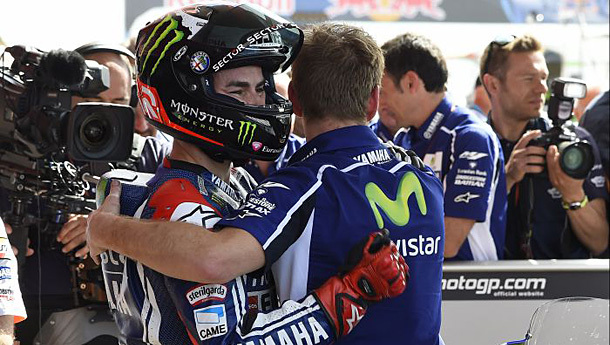 Jorge Lorenzo has his first front row start for 2014. Another good performance from Aleix Espargaro (NGM Forward Racing) on the ‘Open’ Forward-Yamaha puts him at the head on the second row, with Italians Andrea Dovizioso (Ducati Team) and Valentino Rossi (Movistar Yamaha MotoGP) qualifying just behind him. After making it through from Q1 Bradley Smith (Monster Yamaha Tech3) will shoot for another top five race result from the front of row three, with Andrea Iannone (Pramac Racing) and Stefan Bradl (LCR Honda MotoGP) behind him. Bradl walked away from a big highside but looked somewhat shaken by the crash. Alvaro Baustista (GO&FUN Honda Gresini), Pol Espargaro (Monster Yamaha Tech3) and the other rider to make it through from Q1, Nicky Hayden (Drive M7 Aspar), will get away from the fourth row. Aussie Broc Parkes (Paul Bird Motorsport) will start from 18th position. 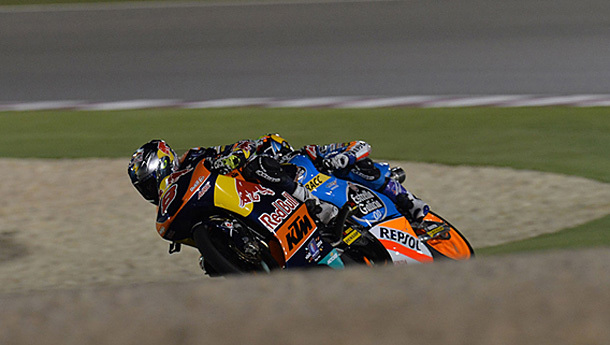 The first ever World Championship qualifying session at the new Termas de Rio Hondo track saw Jack Miller (Red Bull KTM Ajo) take a second successive pole with a 1’49.200s lap, with the Australian rider to be joined on the front row by Efren Vazquez (SAXOPRINT RTG) and Danny Kent (Red Bull Husqvarna Ajo). Championship leader Miller has been quickest in every Moto3™ session so far this weekend at the Gran Premio Red Bull de la Republica Argentina and he will aim for a third successive win in 2014 in Sunday’s race, having secured pole at the renovated 4.8km circuit. Jack Miller in action at Austin, Texas. Vazquez pushed hard to challenge Miller in the final stages, only to miss out by just 0.052s, whilst Kent was over 0.4s down. The second row will comprise of Jakub Kornfeil (Calvo Team) and SKY Racing Team VR46 teammates Romano Fenati and Francesco Bagnaia who will all aim to be in the podium hunt. The third row qualifiers were Niklas Ajo (Avant Tecno Husqvarna Ajo), Alex Rins (Estrella Galicia 0,0) and Livio Loi (Marc VDS Racing Team), whilst Alessandro Tonucci (CIP Mahindra) heads the fourth row having completed the QP top ten. Niccolo Antonelli (Junior Team GO&FUN) crashed after just five minutes and then Eric Granado (Calvo Team) did the same, though both riders soon rejoined. A crash for Alexis Masbou (Ongetta-Rivacold) and Brad Binder (Ambrogio Racing) saw Masbou walk away after going under Binder’s bike. Karel Hanika (Red Bull KTM Ajo) crashed at speed at turn 9 at end of session but was also unhurt. None of the crashing riders were able to get close to top ten times.